Over the past 25 years, AHA has successfully worked with owners, operators, Fortune 500 companies, Ivy League schools, top real estate developers and award-winning architects. They have relied on our passionate team of experts to deliver more than 500 million square feet of high-performance facilities throughout the U.S.
We are consultants and advisors first, focusing on your vision and success during and beyond the project. Our services range far beyond MEP design. From strategic concept development to first class, innovative design … beyond engineering. 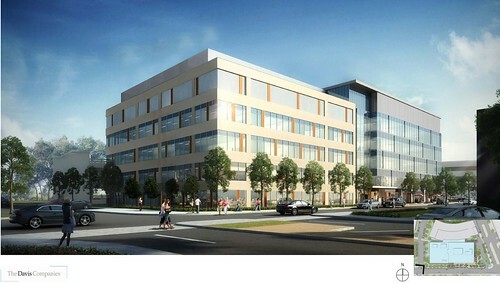 Construction is in the final stages for 20 CityPoint, a new six-story class A office building in Waltham. The project will include a total of 211,000 square feet of office space, 110,000 of which has already been leased to anchor tenant Simpson, Gumpertz, and Heger. The engineering firm plans to move into the space in August. 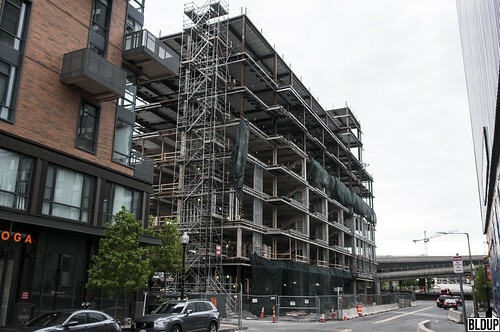 As part of the project, a connector bridge is being built from the second floor of 20 CityPoint to the second floor of 10 CityPoint next door. This connector bridge will allow access to the amenities offered in the 10 CityPoint building which was completed in 2016. The BEAT in Dorchester has secured $252,747,880 in financing via Oaktree Capital. The project calls for the repositioning of the 16.6-acre former Boston Globe headquarters at 135 Morrissey Boulevard in Dorchester. The existing three-story office and an industrial building will be retained and retrofitted into a 695,000-square-foot modern hub for creative office, laboratory and retail uses dubbed The BEAT. The project would create spaces to stimulate growth in fields such as robotics, life sciences, and high-tech manufacturing. A building permit has been issued for The BEAT, the new development project at the former site of the Boston Globe headquarters in Dorchester, MA. The BEAT will include 360,000 square feet of office space and 300,000 square feet of flex/light industrial space, along with retail including a 10,000-square-foot fitness center, a 100-seat restaurant and a micro craft brewery with a food component, including an outdoor beer garden. A portion of The BEAT will be dedicated to robotics-related work. 868 parking spaces and over 200 bicycle storage spaces will be provided on site. Smaller outbuildings will be removed from the existing 815,000-square-foot existing building in order to construct The BEAT, creating 695,000 square feet of space. Demolition of parts of the former Boston Globe headquarters is ongoing to transform the site into a creative hub of office, retail, and lab space. The existing three-story building at the center of the site will be retained and a new multi-story atrium will be built at the entrance. The atrium will be open to the public and offer a food hall and meeting space. In total, The Beat will include 360,000sf of office space, 300,000sf of flex/light industrial space, a 10,000sf fitness center, and a 100 seat restaurant. Be sure to check out their website www.thebeatboston.com for some new renderings, like this amazing one of the lobby. Interior finishing is wrapping up at the new 223,000 square foot state of the art lab building located across from the Alewife MBTA station in Cambridge. The ARC will offer flexible research and development space along with a host of resident amenities including a fitness center and employee lounge. 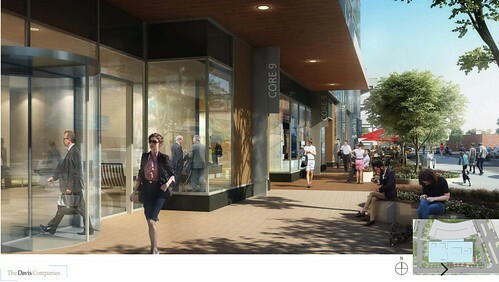 The project also includes around 7,500 square feet of ground-floor retail space. Space is now available for lease with the project expected to be complete by the end of the year. The Davis Companies has leased 26,989 square feet of space in their Alewife Research Center in Cambridge to Ribon Therapeutics Inc., a biotech company that will relocate from Lexington. 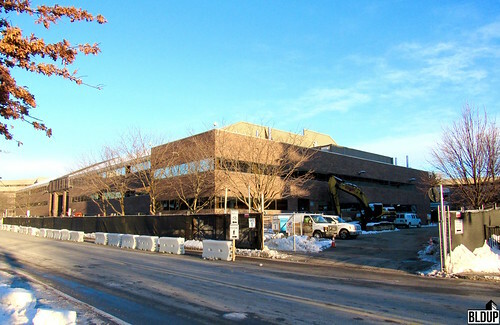 Upcoming 223,000 square foot state-of-the-art laboratory building located across from the Alewife MBTA Red Line station. Alewife Research Center will feature flexible research and development office space with amenities including a two-story lobby, a fitness center, conference/meeting areas and an employee lounge. The Skylounge rooftop is now open at Siena at Ink Block. Reserved for residents of Siena, the Skylounge is tailor-made for entertaining needs, from special occasions to mid-week gatherings. Head to the Skylounge for an after-work cocktail. Unwind by the sparkling fireplace in the lounge. Get the party started by the outdoor fire pit. Or treat guests to dry-aged steaks cooked to perfection on the gas grill. This Boston roof deck is like no other. Designed by Elkus Manfredi Architects, every detail is thought through. Take the large garage-style door that lets light pour in and air flow freely between the lounge and the deck during mild summer nights. Or consider the surprising pops of color and refined millwork throughout the rooftop Skylounge, a nod to the fashion-forward styles and tailored lines of Siena, Italy. Exterior illumination lends a tranquil feel to the space and creates an intriguing crisscross pattern on the façade, just enough for passersby below to notice. Even as you take a seat in one of the elegant sectionals on the deck, glass railings provide unobstructed views of the city. The proposed project consists of the renovation and reuse of the approximately 695,000 square foot building located at 135 Morrissey Boulevard in Dorchester (the former Boston Globe Headquarters). 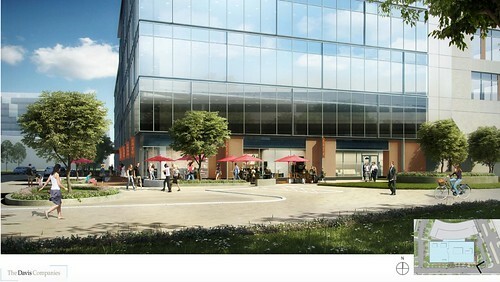 The 135 Morrissey Boulevard project is located in Dorchester at the former Boston Globe Headquarters building. The project includes a comprehensive renovation of both the inside and outside of the former Boston Globe Headquarters building. In addition, the project will include landscaping improvements throughout the project site. Overall, the improvements will result in 695,000 square feet of refurbished space meant to attract creative office, technology, light manufacturing, warehouse, retail, and life science tenants, with approximately 868 off-street parking spaces and approximately 209 bicycle storage spaces. The envisioned building program is made up of the following uses: office/business, tech flex/light industrial, retail/restaurant, food service and fitness space. In addition, the proposed 135 Morrissey Boulevard project will provide community benefits to Dorchester and Boston as a whole. These benefits include 2,500 square feet of space located at the project site to be programmed and utilized as a community job training/employment center, open to the public. This space will be provided at no cost to a local non-profit organization. In addition, a contribution of $4,772,723 in housing linkage will be made to the Neighborhood Housing Trust (NHT), along with a commitment to adopt the Commonwealth of Massachusetts Department of Conservation & Recreation (DCR)-owned public open space known as Patten’s Cove for no less than 10 years. With lab space fully leased, the Alewife Research Center remains on schedule for a 2018 opening. 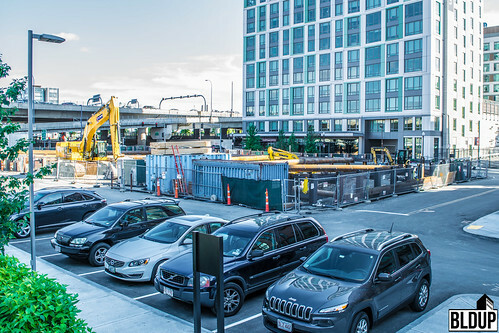 The project, a 223,000-square-foot speculative lab building continues construction across from the Alewife transit station in West Cambridge. 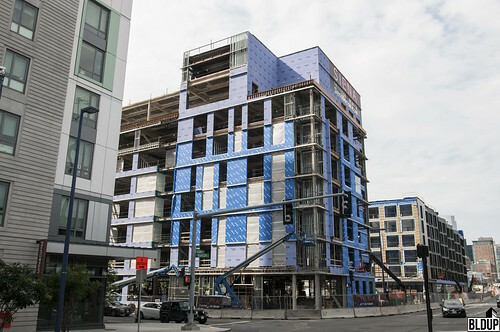 With structural framing, concrete floor pouring, installation of floor-to-ceiling glass, and exterior finish panels along the building's facade underway, the building is beginning to take shape. The project remains on schedule using Touchplan, a construction software that allows developers to plan, implement, and monitor projects in their entirety. The innovative software gives developers the ability to see the full spectrum of their project down to every last detail. Touchplan has let developers keep their projects on or ahead of time leading to lower costs and more efficient construction. 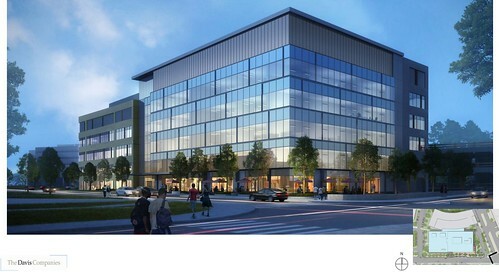 Engineering firm Simpson Gumpertz & Heger (SGH) has leased 110,000 square feet at the upcoming 200,000-square-foot 20 CityPoint Class A office building in Waltham, and construction of the building has commenced. SGH expects to open its’ new, build-to-suit office in Summer 2019. Initial site work is now underway on the 20 CityPoint site in order to prepare for construction of the building's foundation. 20 CityPoint is the second phase of Boston Properties’ 10 + 20 CityPoint development. The first phase, the 245,000-square-foot 10 CityPoint office building, opened in Summer 2016 and is anchored by Wolverine Worldwide. 10 + 20 CityPoint is located just off of Interstate 95/128, a short drive from Boston and Cambridge. 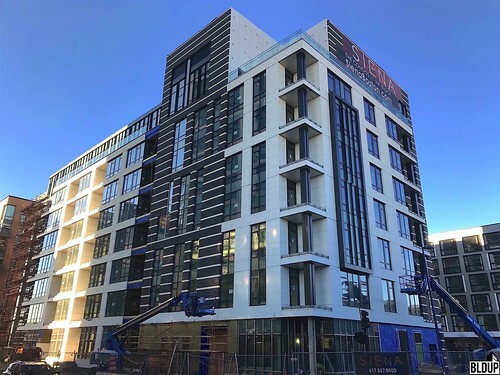 The stunning facade of the South End’s eight-story, 76-unit Siena at Ink Block new-construction condominium building, featuring black and white exterior finish panels meshed with floor-to-ceiling glass, has been just about fully installed. Luxurious interior finishes are now being installed inside the building, including quartz countertops, stainless steel Bosch appliances, hardwood flooring, bathroom tiling and wool carpets in bedrooms, ahead of Siena at Ink Block’s anticipated opening early this year. Nordblom Company and Alcion Ventures, who acquired the former Boston Globe property in Dorchester for $81 million in December 2017, propose to transform the property into The BEAT, a $200 million office and industrial innovation hub that would bring over 3,000 new jobs to the Dorchester economy. The BEAT would repurpose the existing building on site, creating a total of 695,000 square feet including 360,000 square feet of office space and 300,000 square feet of flex/light industrial space. At The BEAT’s center would be a natural light-laden atrium open to the public during working hours, including a food hall and collaborative meeting and gathering spaces. The BEAT would also include a 10,000-square-foot fitness space, a 100-seat restaurant and a micro craft brewery with a food component, including an outdoor beer garden. Nordblom and Alcion hope to start construction of The BEAT in the third quarter of 2018; construction would last 12 to 14 months. The City of Boston is now reviewing the proposed project plans. Nordblom Company and Alcion Ventures, who propose to develop The Boston Globe’s former headquarters at 135 Morrissey Boulevard in Dorchester into a hub for high-tech jobs, have acquired the property for $81 million. The sale of the 815,000-square-foot office and industrial building, which stands on 16.5 acres located just off of Interstate 93, amounts to about $99 per square foot. Acore Capital Mortgage LP provided $75 million in financing towards the acquisition. 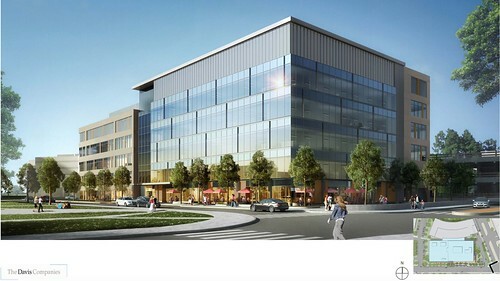 Nordblom and Alcion plan to construct an urban innovation campus on the property, renovating and reusing the existing building to create 690,000 square feet of creative office space for technology and life sciences companies, light industrial space and food & beverage-oriented retail including a craft brewery. The adjacent Patten’s Cove public park would also be overhauled, and improvements would be made to the connectivity of the Savin Hill neighborhood to the nearby JFK/UMass MBTA Red Line station. The Boston Planning & Development Agency (BPDA) is now reviewing Nordblom and Alcion’s proposed plans for 135 Morrissey Boulevard. 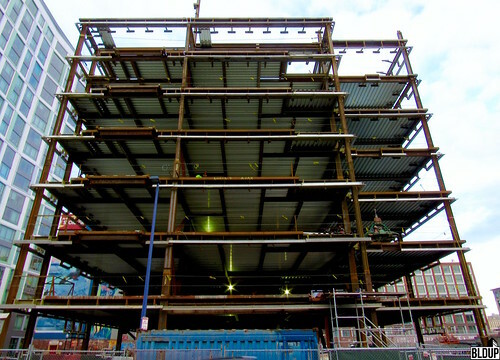 A topping-off ceremony was held last Friday (December 8th) for Alewife Research Center, a 223,000-square-foot speculative lab building under construction across from the Alewife transit station in West Cambridge. With structural framing complete and concrete floor pouring nearing completion, installation of floor-to-ceiling glass and exterior finish panels along the building's facade will soon commence. Completion of Alewife Research Center is expected in 2018, with space now available for lease. Nordblom Company has submitted a Letter of Intent (LOI) to the Boston Planning & Development Agency (BPDA) for 135 Morrissey, the proposed redevelopment of the former Boston Globe Headquarters in Dorchester into a hub for high-tech jobs, kicking off the project’s official review process. As previously reported, the existing building would be renovated and reused, resulting in approximately 690,000 square feet of uses including creative office space for technology and life sciences companies, light industrial space and food & beverage-oriented retail. Significant landscaping and pedestrian realm improvements would be made to the 16.61-acre site, including an overhaul of the adjacent Patten’s Cove public park and increased connectivity of the Savin Hill neighborhood to the nearby JFK/UMass MBTA Red Line station. Nordblom will reveal additional details of the 135 Morrissey proposal in a Project Notification Form (PNF) filing in the coming months. Developer Nordblom Company, who has an agreement in place to acquire the 16.5-acre former Boston Globe headquarters at 135 Morrissey Boulevard in Dorchester, plans to transform the existing three-story building into a hub for high-tech jobs. Existing structures would be retrofitted for new uses including large labs and offices for robotics, life sciences and high tech manufacturing. Per a Dorchester Reporter report, MassRobotics and Cambridge Innovation Center are interested in opening a joint workspace at 135 Morrissey Boulevard. Some smaller outbuildings would be removed from the existing 815,000-square-foot 135 Morrissey Boulevard building, resulting in 690,000 square feet of available space. A portion of the property would become a micro craft brewery with a food component. As part of the project, a multi-use path would be created around the site, renovating the underutilized adjacent Patten’s Cove park. Nordblom’s deal to acquire 135 Morrissey Boulevard is expected to close in mid-November. The latest details and renderings of the proposed project are posted above. Alexandria Real Estate Equities proposes to restore and expand an existing three-story, 12,654-square-foot historic brick warehouse in Kendall Square, located at 41 Linskey Way adjacent to the 100 Binney Street development, constructing a new four-story, 28,505-square-foot conference and meeting center with two restaurants. The conference and meeting center would span 41 Linskey Way’s second and third floors, with restaurants on the building’s first and fourth floors; the fourth floor restaurant would feature a roof deck with outdoor seating. On 41 Linskey Way’s ground floor would be a public transportation hub featuring waiting areas and information about nearby transit and car-sharing programs. 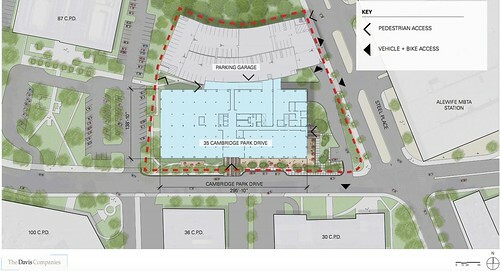 Alexandria has filed plans for 41 Linskey Way with the City of Cambridge, who is now reviewing the proposed project. The upcoming Siena at Ink Block luxury condominiums in the South End, which recently topped off, are already 60% pre-sold. This strong early demand represents the upper South End's recent renaissance, with transformative new developments such as Ink Block bringing new residents and retail options to the area. Siena residents will be located steps from the Whole Foods Market at Ink Block, in addition to multiple desirable restaurants and shops, and a short walk to Downtown Boston, South Boston and the Seaport District. Siena will feature 76 residences, with amenities including a rooftop Sky Lounge and roof deck with sweeping Boston skyline views. Siena is expected to open in early 2018. Local real estate developer Nordblom Company will reportedly acquire the 16.5-acre former Boston Globe headquarters site at 135 Morrissey Boulevard in Dorchester. The Boston Globe and Nordblom reportedly signed an agreement for the acquisition this past Tuesday, August 1st; the deal will likely close this Fall. Development plans for the site have not yet been revealed. A vacant three-story, 815,000-square-foot building currently stands on the site, with the site's remainder comprised of surface parking. The Boston Globe has moved its' operations to a 75,000-square-foot office at Exchange Place in the Financial District, and its' printing and distribution to a 330,000-square-foot industrial building in Taunton. 212 Stuart Street, a new mixed-use tower located in Bay Village featuring 133 apartment residences and 3,000 square feet of ground-floor retail, was approved at last night (June 15th, 2017)’s Boston Planning & Development Agency (BPDA) Board Meeting. Resident amenities at 212 Stuart Street will include an outdoor landscaped rooftop deck with a southern exposure and sweeping city views, in addition to common space. 11 residences at 212 Stuart Street will be designated affordable; developer Transom Real Estate will also make a $3,309,507 contribution towards the creation of affordable housing in Boston. As part of the 212 Stuart Street project, public realm improvements will be made to the adjacent Church Street public plaza. 212 Stuart Street will require additional approval by the City of Boston’s Zoning Board of Appeals (ZBA) in order to proceed with construction. The Noannet Group has revealed new details of its’ proposed Readville Campus 521-unit middle-income apartment development in Hyde Park, which would provide the City of Boston with much-needed middle-income housing located steps to the MBTA commuter rail with rents meaningfully below those in new developments in core neighborhoods. The development would include multiple amenities targeted towards innovative millennial residents, including a two-story workshare space encouraging residents to work from home, a large gym with multipurpose rooms and a half-court basketball court, a coffee house and a rooftop pool and hot tub. Readville Campus would be oriented about a central pedestrian plaza; 36% of the development would be comprised of landscaped green space. Readville Campus would open Sprague Pond to the public for the first time in decades, constructing a new park, waterfront restaurant and pondside lounge. Additional information about Readville Campus is posted above. “The City of Boston is desperately in need of new housing designed not for the top or bottom ends of the income spectrum but for everyone in the middle,” said Jordan Warshaw, Founder and Principal of The Noannet Group, in a prepared statement. 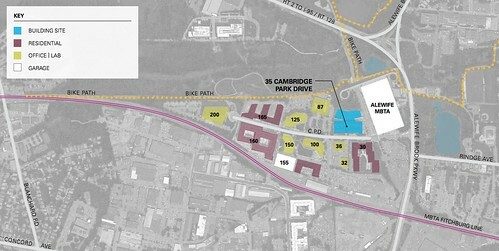 “By creating a development with over 500 new residences on an underutilized site surrounded by train tracks and directly adjacent to the Readville commuter rail station, we will not only help make a significant dent in the City’s middle income housing crisis but do it in a transit-oriented manner that will help minimize its impact on the surrounding community.” The Noannet Group has filed a Project Notification Form (PNF) with the Boston Planning & Development Agency (BPDA) proposing to construct Readville Campus; the BPDA is now reviewing the project. Center Court Properties has reportedly backed out of a deal to acquire the 16.5-acre Boston Globe headquarters in Dorchester for over $80 million. “We’re enthusiastic about exploring other possibilities,” said Globe Chief Operating Officer Sean Keohan in the Globe's report. Center Court's abandonment of the deal follows Winstanley Enterprises pulling out of its' agreement to acquire the Globe property in 2015. The Globe will still move forward with its' move to a new 75,000-square-foot office at Exchange Place in the Financial District this June. A topping-off ceremony was recently held for Siena at Ink Block, the South End’s latest luxury condominium building. 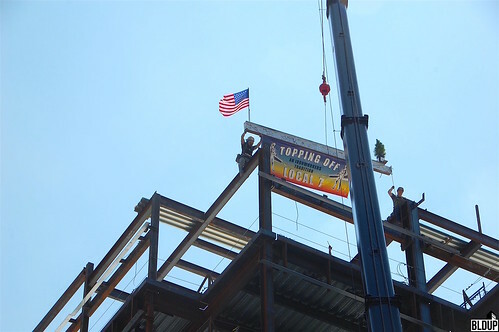 Hundreds of construction workers and the Siena project team gathered last Friday (April 28th, 2017) to formally hoist the final steel beam of Siena’s 8-story frame into the sky and install the beam at the frame’s summit. National Development Managing Partner Ted Tye spoke briefly prior to the beam’s installation, thanking the construction and project teams for their hard work. Siena will be located in National Development’s vibrant Ink Block development, which upon Siena’s completion will be home to nearly 500 housing units, the acclaimed Bar Mezzana, Fuji at Ink Block and Lion’s Tail restaurants and top-quality retail including a Whole Foods grocery store. The Davis Companies began work last week on Alewife Research Center, a new 223,000 square foot laboratory building in Cambridge. 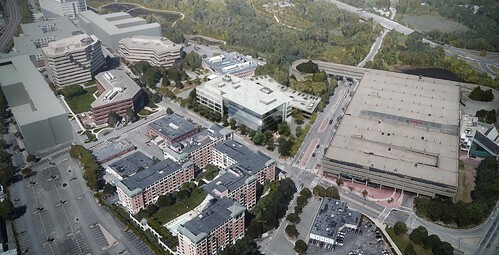 Alewife Research Center will be located across from the Alewife MBTA Red Line station and will feature state-of-the-art research and development office space intended for biotechnology companies. Completion of Alewife Research Center is anticipated in 2018, and space is now leasing. The project received final approval from the City of Cambridge in December 2016. Developer Transom Real Estate has released new renderings of the proposed 19-story 212 Stuart Street apartment tower in Bay Village. The new renderings released provide perspectives of the tower’s ground floor and massing along Stuart Street. The latest 212 Stuart Street renderings are posted above. Transom Real Estate, a newly formed real estate development entity comprised of three former Related Beal executives, proposes to construct a 19-story apartment tower in Bay Village. The tower, 212 Stuart Street, would feature 131 residential apartments with 3,000 square feet of ground-floor retail. The development team has submitted a Project Notification Form (PNF) for 212 Stuart Street to the Boston Planning & Development Agency (BPDA). 212 Stuart Street is now under official review. The Noannet Group has filed a Letter of Intent (LOI) with the Boston Planning & Development Agency (BPDA) proposing to construct Readville Campus, a 556,625 square foot mixed-use development that would transform a primarily industrial section of Hyde Park's Readville neighborhood; the following is a link to the LOI. The development would be transit-oriented and would be built on a 6.16-acre site fronting Sprague Pond located steps to the MBTA commuter rail. Four new buildings would be constructed containing 521 residential apartments and a 5,980 square foot, 150-seat restaurant. Construction of Readville Campus is expected to commence in late 2017. Siena at Ink Block’s 31-space underground parking garage is just about fully excavated. A retaining wall consisting of H piles and wooden lagging has been installed along the garage’s perimeter to retain the future building’s foundation. A horizontal foundation support system consisting of large-diameter round steel beams has been installed across the garage to further reinforce the foundation. Concrete piles have been driven into the base of the garage to support the future building. Visit the construction site’s camera for real-time imagery of Siena at Ink Block as well as the neighboring AC Hotel South End project. Banker & Tradesman reports that David Ridini of Center Court Properties, based in New York, will acquire The Boston Globe’s 16.5-acre Dorchester headquarters facility for approximately $80 million. The sale price would top the $70 million that John Henry paid to acquire The Boston Globe in 2013. Ridini is a partner in JDMD Owner LLC, developer of the 71-unit Archer | Donahue condominium project on Beacon Hill approved by the Boston Redevelopment Authority for construction this month. Ridini is also a partner in 171 Tremont LLC, developer of the 18-unit 171 Tremont Street condominium project in Downtown Crossing. Ridini is also a partner in CC Bunker Hill Owner LLC, who acquired the 52,944 square foot Bunker Hill Business Center at 440 Rutherford Avenue in Charlestown for $14.725 million in September 2015. The Boston Globe reports that it has reached an agreement to sell its 16.5-acre headquarters facility located along Morrissey Boulevard and Interstate 93 in Dorchester. A locus map of the facility is posted above. The 16.5-acre facility includes the 815,000 square foot Boston Globe headquarters building in addition to surface parking lots. Citing a confidentiality agreement, The Boston Globe has not disclosed the facility's buyer. The Boston Globe's headquarters will move to Exchange Place (53 State Street) in Downtown Boston, and printing and delivery operations will move to a new facility in Taunton, MA. This page will be updated with additional details as they become available. 212 Stuart Street was sold today for $6 million to Stuart Acquisition 12 LLC, a limited liability company (LLC) registered in Massachusetts. The other three parcels were sold today with a separate deed for $7.5 million to Stuart Acquisition 22 LLC, a LLC registered in Massachusetts. The registered agent for both LLCs is law firm Sherin and Lodgen. The official buyer of the four parcels has not been disclosed. Development has been proposed for the parcels in the past. An eight-story residential building was approved for construction by the Boston Redevelopment Authority for 212 Stuart Street in 2006; the approved building was never built. 212 Stuart Street's then-owner was Metropolitan Housing Partners of New York. 212 Stuart Street was sold in 2012 for $3.3 million by Hera Development Corporation to Northwood Investors, then-owner of Boston's Revere Hotel. A preexisting three-story commercial building at 212 Stuart Street was demolished in summer 2014. 212 Stuart Street changed hands again in December 2014 when it was sold for $5 million to Pebblebrook Hotel Trust, who also bought the Revere Hotel around the same time. 222 Stuart Street, 17 Shawmut Street and 19 Shawmut Street were owned by Vasilios Kotzampaltiris since 1983 and have been used as a parking lot. Sepia at Ink Block is complete and occupied. The construction site at Sepia is bustling with activity as Sepia, Ink Block's first condominium tower, nears completion. Check out our recent photographs of Sepia above.